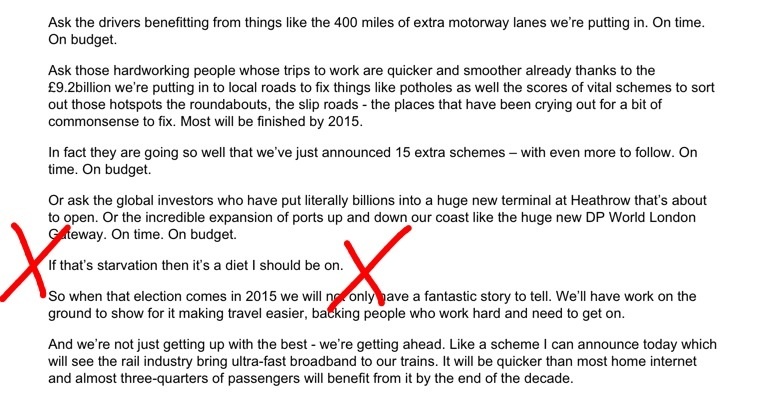 TRANSPORT Secretary Patrick McLoughlin, who attacked the “moaning London commentators” opposed to the HS2 rail-link at the Conservative conference this week, appeared to do some last minute editing to his main stage speech. On the platform on Monday, he stopped over his words – you can see it soon after the 20 second mark in the clip above – and flashed a very brief picture of confusion across his face. He had been in the middle of reciting a list of transport achievements which he said showed the government could not be accused of ‘starving’ road and rail of investment. Although this pay-off would surely only have been meant as a bit of modest, Picklish humour, Mr McLoughlin decided against it. The most cynical were wondering whether something had clicked that jokes about diets and starvation, and how well fed ministers would play so well in a country with emergency foodbanks. Either way, Mr McLoughlin summoned up an alternative ending about Labour not investing enough and two goes at: “We’re changing that”. The missing gag, however, still appears on the speeches section on the Conservative conference website for some form of posterity.